Size15 ½ in. x 19 ½ in. Overall 20 ½ in. x 24 ½ in. 15 ½ in. x 19 ½ in. Overall 20 ½ in. x 24 ½ in. Tomakan attended the Art Students League in Manhattan and the Cooper Union of Art & Engineering. 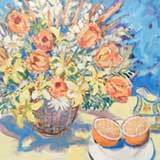 Her professional affiliations include The Lyme Art Association, American Society of Marine Artists (ASMA), Rowayton Arts Association, Art Society of Old Greenwich and The Greenwich Art Society.